UPDATED: Tue., July 11, 2017, 3:16 p.m. Fat Tire Revolution Series, March 19-Sept. 23: includes 8 mountain-biking and off-paved road gran fondoes and races in central Washington, team and solo. Hilly Nilly Grinder Series, loosely organized mixed-surface events in Coeur d’Alene area. Hub-a-Palooza downhill mountain bike events, April 1-3: At Beacon Hill-Camp Sekani in Spokane. Ronde Von Palouse, April 8: road race on 16-mile mixed-surface circuit near Spangle, Wash.
Cooper Jones Twilight Series, Tuesday nights, April 11 through July: Alternates from criteriums at Airway Heights to road races around Spokane. Wednesday Night Mountain Bike Series, races Wednesdays in May and June, for all ages and abilities, starting 6:30 p.m. at Riverside State Park's Seven Mile airstrip in Spokane. Tour de Bloom, May 5-7: Cycling Omnium by Wenatchee Valley Velo Club includes hill climb, criterium and road race. Nakusp Road Bike Invitational, May 13-15: Three stage event includes hill climb and road race based out of Nakusp, British Columbia. 24-Hours Round the Clock mountain bike race, May 27-28: Go solo or with a team in this endurance and social classic at Riverside State Park in Spokane. 12 hours of Disco, May 20-21: Mountain bike solo or team event on an 11-mile track near Salmon, Idaho. Silver Mountain Race Series, July through September. Two divisions, Downhill and Super-Downhill. Butte 100 mountain bike race, July 29: Billed as the country's toughest MB event; route follows Continental Divide, 25, 50 or 100 miles. Limit 350 riders. Inland NW CycloCross Series, to be scheduled for October and November. Following is The Spokesman-Review’s 2017 Northwest Bicycling Events Calendar, the expanded list for events generally within a 300-mile range of Spokane. Some of these tours are club affairs while many are fundraisers that feature great food, with cyclists happily donating to charitable causes in return for the pampering of a well-oiled event. Plan ahead. Quotas for some popular events are reached months in advance. Other events offer discounts for early registration. See the ‘you snooze, you lose’ list of several of the most popular spring and summer events that require applicants to be on the ball during winter. Chilly Hilly, Feb. 26: Kicking off the cycling season for more than 40 years, 33-mile route around Bainbridge Island attracts about 6,000 riders. About $30 with ferry fare. Gran Fondo Ephrata, March 19: Ride 80 miles on mixed surface roads out of Ephrata, Wash. First of five events in Vicious Cycle Gran Fondo series. $70. Valley River Ride, April 2: New in 2017, ride 35, 52 or 62 miles from Renton along the Cedar and Green rivers; by Cascade Bicycle Club. Spokane Bike Swap and Expo, April 8: Buy or sell used bikes at Spokane County Fair and Expo Center; benefits Friends of the Centennial Trail. $5 entry, kids under 13 free. Gran Fondo Goldendale, April 9: Ride 90 miles on mixed surface roads out of Goldendale, Wash. One of five events in Gran Fondo series. $70. Daffodil Classic, April 9: Ride 40-, 60- or 100-mile loops in the Orting Valley southeast of Tacoma; treats finishers with strawberry shortcake, 42nd annual event sponsored by Tacoma Wheelmen’s Bicycle Club. $40. Tulip Pedal, April 15: Ride 20, 40 or 60 miles in the 36th annual event past tulip fields based out of La Conner. $35. Tour de Lopez, April 29: An annual sellout 5, 12, 17 or 31 mile supported tour plus lunch on Lopez Island, perhaps the quaintest of Wasington’s San Juan Islands. Limited to 900. $25-$45 ($115 families). Montana Hell Ride, April 29: Pedal 52 or 85 miles of mixed surfaces out of Missoula area; aid stations, support vehicles. $30-$40. McClinchy Mile Bicycle Ride, April 30: Arlington, Washington, 35th annual ride with loops of 28, 33 or 44 miles, plus option to ride them all for 105 miles; with food stops, post-ride burger and beer. $45. Ride Around Clark County, May 6: The 34th annual event includes routes of 100, 66, 53, 34 and 18 miles, fully supported, food, hosted by the Vancouver (WA) Bicycle Club. $25-$35. Seattle Bike-n-Brews, May 7: Urban ride exploring Seattle breweries, with routes of 33 or 43 miles, sponsored by Cascade Bicycle Club. Limited to 500 riders. $20-$50. National Bike to School Day, May 10. Get details locally at participating schools. Kidical Mass, May 13: Safe Spokane bike ride for kids on 3-mile, vehicle-free course in Chief Garry Neighborhood beginning at Chief Garry Park, 1 p.m. Free. Inland Empire Century, May 13: Ride 25, 50, 75 or 100 miles from Columbia Park in the Tri-Cities through orchards, vineyards and farm fields in the lower Yakima-Columbia river valleys, sponsored by Kiwanis and Group Health. $10-$50. Skagit Spring Classic, May 13: Skagit Bicycle Club’s 27th annual event, routes range from 25 to 100 miles between Burlington and Bellingham. Rest stops, sags, showers, pasta feed included. $10-$45. Lewis County Historic Bike Ride, May 13: The 35th annual event has rides of 20, 48, 68 or 100 miles based out of Stan Headwall Park, Chehalis, Wash., hosted by Chehalis-Centralia Optimist Club. $35-$45. STOKR, May 13-14: Ride 82 or 135 miles in two days in the Scenic Tour of the Kootenai River based out of Libby, Mont. Limit of 450 riders filled by lottery. Applications available in February. 2017 registration is closed. Bike to Work Week, May 15-19: Hundreds of cyclists participate in Spokane’s promotion of bicycle commuting. Week kicks off with a free bike commuter breakfast at Riverfront Park plus other activities. 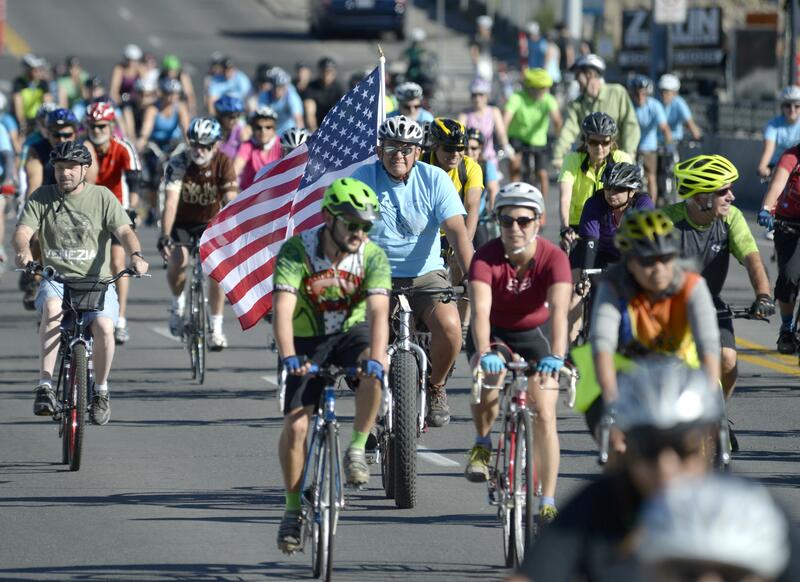 Ride of Silence, May 17: A slow, respectful 6-mile ride in Spokane is among hundreds around the world for 14th annual event commemorating cyclists killed in traffic. Loosely organized; meet 5:45 p.m. at Riverfront Park, location to be announced because of construction. Rock & Ride through George, Wash., May 20: The 11th annual event features courses of 18, 35 or 70 miles based out of George Community Hall; food afterward. $15-$35. Woodrat 25er mountain bike ride, May 20: Choose 25-mile endurance or 12-mile route of intermediate to advanced riding on mix of double track and single track riding near Priest Lake, Idaho. $29-$45. Gran Fondo Leavenworth, May 21: A difficult ride of 87 miles on mixed surface roads out of Leavenworth, Wash. One of five events in Gran Fondo series. $70. 24-Hours Round the Clock mountain bike race, May 27-28: Go solo or with a team in this endurance and social classic, with camping, music, prizes at Riverside State Park Seven Mile Area. $275 solo to $625 for five-person team, junior discounts. Century Ride of the Centuries, May 27-29: Three days of fully supported riding and meals with new routes of 25, 40, 60, 100 miles each day through Eastern Oregon farmlands near Pendleton and Blue Mountains. Limited to 275 riders. $195 (discounts for youths). Emerald City Bike Ride, May 28 : (Sold out) Billed as Seattle’s largest bike ride (10,000 cyclists), follows 10- or 24-mile routes closed to traffic. $27-$40. Bite the Bullet Tour, May 28: A 70-mile tour with 4,000 feet elevatioin gain including Winchester Grade out of Lewiston. Loosely organized by Twin River Cyclists (Lewiston-Moscow area). 7 Hills of Kirkland, May 29: A 40-mile “seven hills” route, a 62-mile metric century or a 100 miler from urban to rural roads on a low-traffic holiday. Limited to 1,800 riders. $30-$80 with early registration discounts. National Bike Travel Weekend, June 2-4: Adventure Cycling based in Missoula has assembled online resources, including contacts with ambassadors, to encourage cyclists to try an overnight bicycle tour in their own region, whether the destination is a campground, motel or Warm Showers host. Apple Century, June 3: Routes are 25, 50 or 100 miles in the 30th annual event starting from Walla Walla Point Park in Wenatchee. Organized by Wenatchee Sunrise Rotary; 700-800 riders. $55-$75. 3 Rivers Race, June 3: Ride 35, 55, 70 or 100-mile routes (also running options) based in La Grande, Oregon., through Grande Ronde Valley; 16th annual event benefits fight against domestic violence. Includes barbecue and poker run for prizes. $50 minimum pledge ($100 family). Pedal Around a Glacier, eh!, June 3-4: The 22nd annual PAGE starts in Nelson, British Columbia, for a two-day, 140-mile ride along Kokanee and Slocan lakes and twice across the spine of the Selkirk Mountains to loop around Kokanee Glacier Provincial Park. Overnight in New Denver along Slocan Lake. $99. TOSRV-West, June 3-4: The 47th annual Tour of the Swan River Valley follows the original two-day, 226-mile loop from Missoula to Bigfork, returning along Flathead Lake to Missoula, with great food stops. Bus shuttle option for return. Limited to 200 riders. $115 plus Missoulians on Bicycles membership. Woodinville Wine Ride, June 4: Ride 30-mile route, including Sammamish River Trail to Woodhouse Win Estates with wine and food tasting; by Cascade Bicycle Club. Age 18 and over only. $50. Gears for Beers, June 4: Mountain bike poker ride on 16 miles of intermediate-to-had riding or a family friendly ride out of historic Virginia City, Montana; includes BBQ and beer. Benefits rural fire department. $40. Flying Wheels Summer Century, June 10: Based from Redmond, ride through Western Washington’s Snoqualmie Valley on route options ranging from 23 to 100 miles; by Cascade Bicycle Club. $50-$60. Lions Bike For Sight, June 10: Ride nearly 100 miles between Missoula and Hamilton, Montana, fully supported with BBQ. Also 10-mile family ride. Fundraiser for Lions Clubs charities. $15-$55. Lemhi Valley Century, June 10: Ride 100 miles or 100-kilometers along Idaho 28 out of Salmon, Idaho. $30-$60. I Made the Grade, June 10: Based out of Chief Timothy Park near Clarkston, the 35th annual 18-mile ride climbs 2,000 feet up the Lewiston Grade via the Old Spiral Highway. Organized by Clarkston High School Band. $25-$35. Flying Wheels, June 10: Ride routes from King County’s Marymoor Park ranging from 23 to 100 miles through the Snoqualmie Valley. $20-$60. Gran Fondo Ellensburg, June 11: Ride 90 miles on mixed surface roads out of Ellensburg, Wash. Fourth of five events in series. $70. CHaFE 150 Gran Fondo, June 17: Ride 30or 80 miles, or the full 150-mile loop through Cabinet Mountains, timed Gran Fondo, five food stops, from Sandpoint, through Troy and Bonners Ferry and back. Benefits autism programs in local school district, sponsored by Sandpoint Rotary. Limited to 500 riders. Showers available. Team options. $55-$85 (plus $50 pledge requirement). Silver Valley Ride to Defeat ALS, June 17: Fundraiser ride on the Trail of the Coeur d’Alenes out of Enaville, Idaho, on routes of 27 or 42 miles. Entry $50-$75 plus $100 in donations. Cascade 66, June 17: Pedal 33, 66 or 100 miles along the Missouri River between Cascade and Wolf Creek, Montana, sponsored by Cascade Lions Club. $66. Tour de Blast, June 17: Limited to 2,500 riders on national monument roads in Mount St. Helens volcanic blast zone. Routes cover 33, 54 or 82 miles with longest tackling 6,240 in elevation gain; post-ride pasta feed. Sponsored by Longview Rotary. $55-$95. Spokane Summer Parkways, June 21 on South Hill at Comstock-Manito Neighborhood, 6 p.m.-9 p.m. Event designed for families to walk or ride streets free of motor vehicles, with games and contests. Free. Ride the Wall, June 21: Celebrate summer equinox in 19th annual 13-mile evening ride along Coeur d’Alene River; start and finish at Mission Inn in Cataldo, followed by barbecue. Benefits Silver Valley Fuller Center for Housing. $30. Lewis-Clark Summer Games, June 21: Senior competitive series with 13 sports/events include 5K and 10K time trials for men, women age 40 and older; fundraiser for WA-ID Volunteer Center. $35 plus individual event fees. Lake Chelan Century Challenge, June 24: Join 500 riders on one-to-three loops ranging from 30-40 miles each past Lake Chelan vineyards. Sponsored by wineries and Chelan Rotary. Do the entire century ride and bag 9,600 vertical feet of elevation. $60-$70. RATPOD, Ride Around the Pioneers in One Day, June 24: Ride 126 miles through Pioneer Mountains out of Dillon, Mont. 16th annual event offers optional Strava segments. Online registration opens in March until the cap of 650 riders is reached; waiting list. Benefits Camp Mak-A-Dream. $125 plus $100 minimum donation. Mount Adams Country Bicycle Tour, June 24: Ride 12, 51, 54 or 105 mile routes in the 15th annual event based out of Trout Lake, Washington; fully supported, meals. $10-$55. Mazama Ride, June 24-25: (SOLD OUT) runs 75 miles each day on North Cascades Highway from Marblemount to Mazama for the overnight and back; 11,600 feet of climbing; by Redmond Cycling Club. $145-$195. Relay for Life, various dates for walk/run or cycling events around the region to benefit American Cancer Society. Northwest Tandem Rally, July 1-4: Popular roving holiday weekend event for two-seaters, this year based out of Seattle. Gran Fondo Kootenai, July 1-2: Ride 76 miles from Libby to Eureka, Mont., and return on a 98 mile route with plenty of elevation gain the next day. Limited to 100; fully supported including dinner, breakfast. Benefits Kiwanis-Lions programs. $200 (more after June 15). Okanogan Trestles Tour, July 2: Ride 20K, 40K or 80K routes at Myra Canyon on the Kettle Valley Railway from Kelowna to Penticton, B.C. $24-$140. Seattle Night Ride, July 7: Ride a 15-mile route begining in Ballard and including Burke-Gilman Trail. Costumes, tricked-out bikes optional, but headlight, rear light and rear reflector required. $20-40. Wheels to Meals, July 8: 12th annual ride, a fundraiser to support hungry families in Pierce County. Choose from 10-, 20-, 32-, 56-, and 75-mile routes that start and end at WSU’s Puyallup Campus and take you through the scenic Puyallup Valley and surrounding areas. Huckleberry Ride, July 9: Loosely organized by Twin River Cyclists (Lewiston-Moscow area), the ride starts in Deary City Park at 9 a.m. and runs 54 miles to Elk River and back. Missouri River Scenic Century, July 15: Ride 62, 80 or 100 miles along Missouri River from Cascade to Wolf creek and back; poker ride prizes; by Helena Bicycle Club. $70. Tour of the Bitterroot, July 16: Dirt road mountain biking on 20 -mile route, 48-mile Skalkaho Mountain Tour out of Hamilton, Mont., ends with barbecue and beer. Also Kids Dirt Road Derby. Benefits Bitter Root Land Trust. $50. Seattle to Portland Bicycle Classic, July 15-16: STP goes 200 miles, fully supported. Largest of region’s multi-day cycling events with 10,000 riders, sponsored by Group Health. (Sells out in February or March, but refund openings are filled in June.) $80-$155. Glacier Ride, July 18-23: Ride six days, 273 miles in Glacier National Park (Montana) and Waterton Lakes National Park (Canada) with multiple daily mileage options. Benefits Glacier National Park Conservancy. $100 registration, $3,000 minimum fundraising. RedSpoke, July 19-23: Fully supported 30th annual five-day, 300-mile tour from Redmond to Spokane, limited to 150 riders, sponsored by Redmond Rotary. $100 plus $775 minimum in pledges. Blue Goose Family Fun Bike Ride, July 22: Little Pend Oreille National Wildlife Refuge family-friendly 10.5-mile ride on packed, graded dirt roads, interpretive signs. Start 8:30 a.m.-9 a.m. at Refuge Headquarters, 1310 Bear Creek Road southeast of Colville. Finish by 11 a.m. at headquarters for snacks, prizes. Free. Info: (509) 684-8384. RAMROD, July 27: Ride Around Mount Rainier in One Day, ultra-marathon cycling event, 10,000 feet of climbing in 168 miles, by Redmond Cycling Club. Limited to 800 drawn from lottery that closes March 30. $110 if selected. 4 Summit Challenge, July 29: Ride 30, 50, 60 or 90-mile routes and up to four cool mountain summits from Cascade, Idaho, to Landmark and back. Field limited to 400. Supports local charities. $85-$100. Ride Around Washington, July 29-Aug. 5: SOLD OUT. Cascade Bicycle Club’s fully supported camping tour route varies; the19th annual RAW includes the North Cascades Highway; 437 miles in six consecutive days of riding. Limited to 250 riders. $1,035. Spokane Valley Cycle Celebration, July 30: Ride 10, 25 or 50-mile routes based from Mirabeau Meadows Park in Spokane Valley; family friendly with food stops sponsored by ValleyFest organizers. $10-$20. Climate Ride Pacific Northwest, Aug. 3-7: Tour 5 days, 240 miles starting and ending in Seattle and visiting San Juan Islands, Olympic National Park and Canada’s Vancouver Island with multiple daily mileage options. Benefits nonprofit group for environmental education. $100 registration, $3,000 minimum fundraising. -Required participant fundraising supports 100 + bike advocacy, environmental and sustainability focused nonprofits. -The ride starts and ends in Seattle and will visit Washington State’s San Juan Islands, Canada’s Vancouver Island, and Olympic National Park. Eight Lakes Leg Aches, Aug. 5: Ride 30-, 45-, and 75-mile routes, starting from Spokane’s Sunset Hill and out around lakes in Spokane County with about 800 riders to benefit Sexual Assault and Family Trauma Response Center. $50-$60. Info: (509) 343-5020. Blazing Saddles Bike Ride, Aug. 5: Offers new supported routes for 2017 of 43, 68 and 100-miles out of Colville, Washington. In conjunction with the annual weekend Colville Rendezvous Community Celebration; sponsored by Rotary Club. $65. RATSWEST, Aug. 5-6: Sponsored by Helena (Mont.) Bicycle Club, Ride Around the Western Pioneer Mountains goes 120 miles in two days, gaining 3,000 feet over two passes the first day, 1,000 feet with no passes the second; starts near Wise River, overnighting at Jackson Hot Springs Lodge. Limited to 40 riders. $86, plus club membership, $20. Princess Pedalfest, Aug. 5: Women’s bike ride out of Hayden Idaho on routes of 12.5, 25, 45 and 60 miles; fully supported, plus treats, lunch and lots of nice touches. $55-$75. Ride Idaho, Aug. 5-12: The 13th annual seven-day (with rest day), fully supported, bicycle camping tour that moves to different region of the state. 2017 route runs 399 miles in the Ketchum-Sun Valley area. Organized by non-profit group of cyclists. Limit: 350 riders. $975. Obliteride, Aug. 11-13: Seattle-area fundraiser for Fred Hutchinson Cancer Research Center includes 10, 25, 50, 85 or 100 miles in one plus a two-day option and a family ride. Registration starts at $100 plus $500-$1,000 minimum pledges. Suncadia Multi-Sport Festival, Aug. 11-13: Includes 25-mile ride, kids events and runs, with BrewFest. $10-$155. Le Tour de Koocanusa, Aug. 12: From Libby, Montana, ride 44 or 83 miles along Lake Koocanusa in 6th annual event by David Thompson Search and Rescue. Coincides with annual Riverfront Blues Festival. $60. RSVP, Aug. 18-19: Cascade Bicycle Club ride from Seattle to Vancouver and Party, 175-mile route in two days, overnight in Bellingham before riding into Canada. Return by chartered bus. $80-$160. Gigantic Bicycle Festival, Aug. 18-20: Includes 77 and 100 mile rides, cyclocross, workshops, films, and other activities based out of Centennial Fields Park, Snoqualmie, Washington. $60. Tour de Lentil, Aug. 19: Scenic ride has 50- and 100-mile courses with pit stops through rolling Palouse hills based out of Pullman, fundraiser for WSU Cycling Club. Email: cycling@wsu.edu. About $45-$75. Cycle Greater Yellowstone, Aug. 19-25: Fully supported tour through Montana communities in Yellowstone region sponsored by Greater Yellowstone Coalition. $1,395 ($995 juniors). York 38 Special, Aug. 26: Mountain bike 38 miles (or compete in 76-mile cyclocross event) on gravel, asphalt and single track with aid stations out of York, Montana. Sponsored by local firefighters. $35-$45. Mary Bridge Children’s Courage, Aug. 26-27: Choose from five different rides based out of Eatonville, Washington including one-day 5 mile family ride, and 30 and 50 milers, plus two-day 150 and 175 milers. Benefits Mary Bridge Children’s Hospital & Health Network. Fees $35-$75 plus Fundraising minimums $50-$750. High Pass Challenge, Aug. 28: Cascade Bicycle Club thigh-burner gives up to 600 riders 10 hours to pedal 114 miles and conquer 7,500 feet of climbing around Mount St. Helens; optional route 61 miles with 2,000 feet of climbing. $45-$80. Great Northwest Fall Tour, Sept. 3: Ride 15, 30, 50 or 85-mile routes beginning at Newport City Park. Benefits Newport/Priest River Rotary Club. $35-$50 ($75 per family). Kootenay Rockies Gran Fondo, Sept. 9: Ride 58K, 102K or 152K between Cranbrook and Kimberley, B.C., food and entertainment. $119-$159 (Canadian). Cycle Oregon, Sept. 9-16: Billed as “the best bike ride in America,” ultra-supported tour moves to a different route each year supported by local communities. In its 30th year, 430-490 miles. Spin-off weekend event set for July 7-9. Registration opens in February; fills quickly. $999. SpokeFest, Sept. 10: Spokane event attracts 1,600 participants, families as well as serious riders; 10th annual event based from Kendall Yards has three tour options: a 9-mile loop, the classic river loop of 21 miles in Riverside State Park, and a Spokesman 50-miler extending Classic Loop into the Four Mounds area. $8-$17. NIC Brian Williams Poker Ride, NOT YET SCHEDULED: Annual bike ride to collect cards for prize-winning poker hands; in memory of an NIC student; starts 12:30 p.m. at O’Shays Irish Pub and Eatery, 313 Coeur d’Alene Lake Dr. in Coeur d’Alene. Ride Live music, barbecue, silent auction, door prizes and a T-shirt. Sign up: (208) 676-7169. $25. WaCanId Ride, Sept. 11-16: Rare international bicycle tour on the Selkirk Loop; 7th annual ride includes on new route up to 370 miles (or shorter segments) and 22,000 of elevation gain. Start in Sandpoint, Idaho, or at Nelson, British Columbia. Limited to about 50 riders from each start. Sponsored by Rotary clubs. Info: (208) 267-0822. Passport required. $495, includes jersey. Kootenai River Ride, Sept. 16: Ride 16, 60 or 100 kilometers near Kootenai River out of Boundary County Fairgrounds in Bonners Ferry, Idaho; 15th annual event supported by Rotarians, followed by baked potato feed. $25, family $50. Salmon Arm Bike for Your Life Century Ride, Sept. 16: Ride 10, 35, 75 or 100 kilometers near Salmon Arm, British Columbia, in this 17th annual event limited to 600 riders. BBQ lunch. $5-$30 ($50 family). Kidical Massive, Sept. 16: Safe Spokane bike ride for kids on 3-mile, vehicle-free course starting and ending at Kendall Yards with activities; part of a global event that puts kids on bikes all over the world. 1 p.m. Free. Ride the ROC, DISCONTINUED: Ride 22, 50, 72 or 100 miles through sage-steppe via Omak,Wash., Conconully and Riverside. Sponsored by Omak Kiwanis. $45-$55. Bike MS 150, Sept. 16-17: ride 20, 50, 75 or 100 miles in one day or two, on Trail of the Coeur d’Alenes to benefit local Multiple Sclerosis. Overnight at Silver Mountain Resort. $45, plus donation. RIM Ride, Sept. 16-17: Rotary In Motion Family Fun Ride based from Liberty Lake, Wash., starts with 5-mile family ride on Saturday, then 15, 25, 50 or 100 miles rides on Sunday finishing with lunch and beer garden. $5-$60. Kootenay Suffer Fest, Sept. 17: Based out of Kaslo, New Denver and Nakusp, British Columbia, gentle to extreme events include mountain bike, cyclocross, duathlon, trail runs and kids races. Costs vary. Friday Harbor Bike-N-Brew, Sept 23: Limited to 200 riders. Offers a choice of three bike routes (25-, 36-, or 50-mile courses with support) exploring the picturesque back roads of San Juan Island. After the ride, relax and share your stories with fellow riders at brew tasting at Brickworks in Friday Harbor. Bike event, $60; Brew event, $25. Gran Fondo Winthrop, Sept. 23: Ride 90 miles on mixed surface roads out of Winthrop, Wash. Last of five events in series. $70. Kettle Mettle, Sept. 23: Gravel Road Cycling Fondo on British Columbia’s Kettle Valley Railway, ride 50K, 100K or 120K in Penticton to Kelowna area, supported, categories for solo and team and bike style, wine festival and After Party in this 4th annual event. $85-$150 (Canadian), with team prices. Coeur d’Fondo, Sept. 23: The 6th annual Gran Fondo style timed event begins and ends in Coeur d’Alene with competitive and non-competitive options. Choice of five distances: 15, 37, 47, 84 or 108 miles. Riders end with entry to Oktoberfest. Course features Lake Coeur d’Alene and Idaho’s Highway 97 Scenic Byway through Harrison and St. Maries. Shorter ride participants board a partyboat back to Coeur d’Alene from Harrison (Riders on 47-mile ride board boat to start at Harrison). Sponsored by Idaho Centennial Trail Foundation. $25 for family ride, $85 for others. Kitsap Color Classic, Sept. 24: Ride 25, 37 or 57 miles in 24th annual event through fall colors and small communities on Kitsap Peninsula, organized by Cascade Bicycle Club. Food stops and pancake breakfast. $40-$45. Rotary Rivers & Ridges Ride, Sept. 30: Includes family rides of 7, 14 or 25 miles as well as challenging 50 or 100 milers from Clarkston, Washington., area, with a Riverfest event. $20-$50. Chewelah Valley Lions Fall Half-Century Bike Tour, Oct. 1: Includes 25 or 50 miles from Chewelah to Springdale and back via Stevens County loop around Waitts Lake, plus 10-mile ride for kids. Sign ups allowed up to the 10 a.m. start in Chewelah City Park. Sponsored by Lions Club. Info: Becky Washington, rebecca214@centurytel.net. Tour de Rock Mountain Bike Ride & Rough Ride, Oct. 7: At 49 Degrees North Mountain Resort. Choose from at least three rides, including a bunny hill tour at the resort or a challenging climb starting in Chewelah and gaining 4,000 feet of elevation on a variety of surfaces. Party and prizes. Benefits 49 Degrees North Winter Sports Foundation. Info: (509) 937-4922 or nordic@ski49n.com. Manastash Metric Century, Oct. 7: The 21st annual ride includes 50K or 100K options along the Yakima River from Ellensburg to Cle Elum and back. $40. Western Montana Hill Climb, Oct. 1 (always the first Sunday in October): Time-trial-style 4-mile climb gains 840 feet up Pattee Canyon in Missoula; nine categories including new riders plus eight bicycle categories for the 40th annual event hosted b Missoulians on Bicycles. Prize for every rider. $3. Published: April 5, 2017, 7:22 p.m. Updated: July 11, 2017, 3:16 p.m.